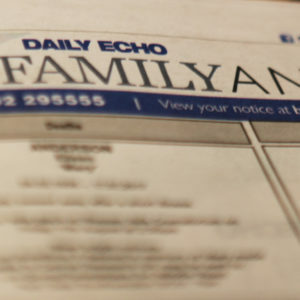 We offer a wide range of options to help you pay fitting tribute to your loved one. 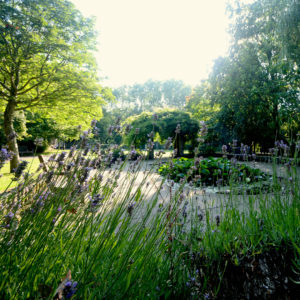 Where, either from personal choice or financial preference, a secular or religious service for mourners to attend is not desired or is inappropriate, we are able to facilitate a dignified direct cremation service. This includes collection of the deceased from a local hospital or mortuary, provision of a quality, simple coffin, and direct transfer to a crematorium at a date and time amenable to ourselves as the funeral director. Prices from £700 plus disbursements which are for crematorium and doctors certification fees. With such a wide range of options is available, we’re able to help you pay a fitting tribute to your loved one. 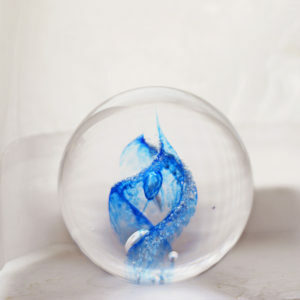 We can usually accommodate most requests, so if you have something specific in mind, please ask us. 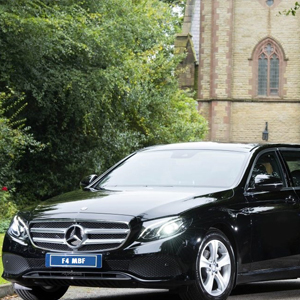 A hearse and limousine is provided as part of our service, which are chauffeur driven and can comfortably seat six people. Additional limousines are available on request. 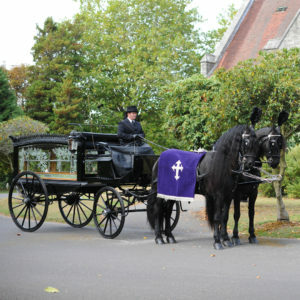 We can provide a traditional hearse drawn carriage with a magnificent pair of matched black plumed Friesian horses, complete with rosettes and brass-decorated harnesses, and driven by a traditional liveried coachman and groom. We are able to supply almost any coffin, to suit every preference and budget, whether it be traditional solid wood, wood veneer, the environmentally friendly willow and wool, or one of the more individual printed and shaped coffins. Most funerals take place in the context of a traditional religious service, led by a member of the clergy. We can also offer a non-religious, humanist or civil funeral, as we have a choice of celebrants who will provide a personal and dignified celebration of your loved one’s life. Our Chapels of Rest have been individually designed to provide a peaceful and tranquil atmosphere for families wishing to pay their last respects to a loved one in the days leading up to the funeral. We offer a large variety of head stone choices, offering design advice for a fitting memorial for your specific requirements. 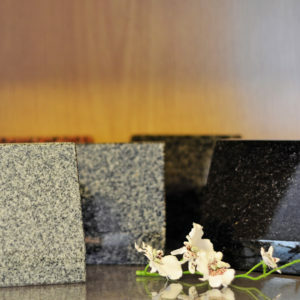 We provide a range of stones, designs and engraving options for your stone monument. You may wish to announce the death, and give details of the funeral arrangements in a local, national or international newspaper. We can assist you with this and help with the wording, should you need it. You may also wish to consider an ‘acknowledgement’ notice at a later date which is a way of recognising the support of well-wishers and expressing thanks for flowers and cards, as well as thanking the minister, we can also assist in this for you. We are able to provide beautiful floral tributes that are always hand delivered by the florist a couple of hours prior to the funeral to your exact requirements. A choice of music and hymns is an important part of the funeral service. 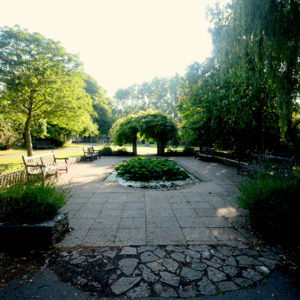 Various crematoriums along with Bournemouth now operate the Wesley Music scheme which has a huge range of licensed music from modern hits to old classics. 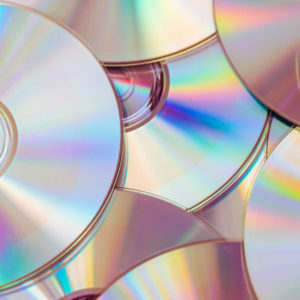 We can prepare the music in advance and have it ready to play at the appropriate time during the service. The Wesley Music website is available at www.wesleymusic.co.uk We can also arrange if required organist, Highland Piper, Bugler in fact whatever choice of music is preferred by your loved one, it is a special way of remembering them and celebrating their life. We are able to supply a range of funeral and mourning stationery, including printed orders of service and condolence books. 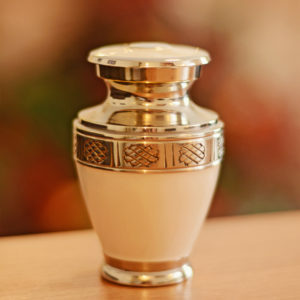 We can provide a selection of urns and jewellery to suit your needs. 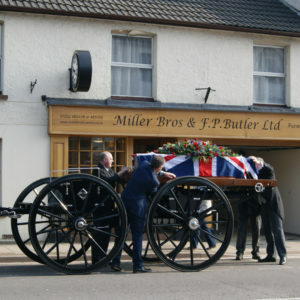 We are a privately owned family run Funeral Directors established in Christchurch, Dorset. 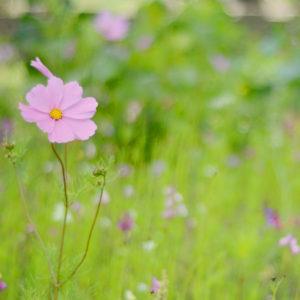 We provide the highest standard of funeral service and support to the people of Christchurch and the surrounding areas.